IOTA CAS (Iota Cassiopeiae). It's easy to remember the Greek letter names of the seven stars of Ursa Major's Big Dipper, as they just go in sequence from Alpha at the eastern end through Eta at the western regardless of brightness. Opposite the pole, Cassiopeia's letters are a bit harder to recall; but aid is available in the form of a handy mnemonic, the non-word "BAGDEI." The first five letters from west to east give us those of Cassiopeia's famed "W": Beta Cas through Alpha, Gamma, Delta, to Epsilon. Off the eastern end is much fainter just-barely-fifth magnitude (4.52) Iota Cas, which is largely ignored as a result of the luster of the rest of the constellation. And too bad, as the star -- 140 light years away -- is one of the more wonderful multiples of the nighttime sky. A small telescope reveals an attractive triple. The bright member is a fifth magnitude (4.65) class A (A5 peculiar) dwarf called Iota-A. Lying just 2.7 seconds of arc away is 7th magnitude (6.9) class F (F5) Iota-B, while 7.4 seconds of arc out is ninth magnitude (8.7) class K (K1) Iota-C (both dwarfs). While A and B are both white and fairly colorless, C is on the orange side. The closeness of the stars leads to false visual color contrasts that make the system quite pretty and well worth a look. Iota Cas A makes the system yet more interesting, as it displays a wobble in its motion that long suggested that it was itself a close but unresolved double, making the whole affair (at this point in the discussion) a quadruple star. Apparent motion of B around A showed an orbit with an uncertain period of 620 to 870 years, while Iota-C is too far out to show movement. Subject to severe foreshortening, C is certainly farther away from the others than it appears. Iota Cas really reveals one of the great technological advances of the past century, the ability of active "adaptive optics" to "de-twinkle" starlight to allow the observation of greatly improved detail. (As the star jumps one way as a result of refraction in the Earth's atmosphere -- the basis of twinkling -- the telescope optics move in the other way to counter the apparent stellar motion.) Observation of Iota Cas directly shows the very close-in companion to Iota-A (a class G2 star called Iota Cas Aa 0.5 seconds away from A), while multiple observations of the system give the orbit of Aa about A (and thus the system's masses) as well as the relative motion of B relative to the A-Aa binary. 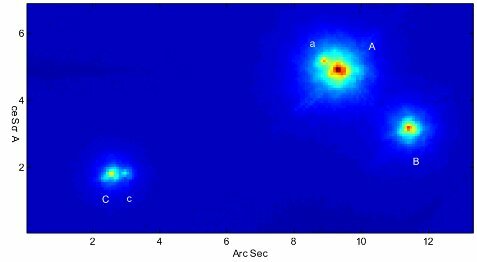 An infrared image made with an adaptive optics system at Lick Observatory shows the locations of the components of Iota Cas. Iota-A dominates the system's brightness. Tucked in just above and to the left of "A" is much fainter Iota-Aa, which mutually orbits Iota-A every 47 years. Iota B and C (the latter also double with the faint "c" component) are visible in a small telescope, and may or may not actually belong to the A-Aa system. Courtesy of Jack Drummond.